We all deserve to be happy and our professional lives should enhance our personal lives, not detract from them. It is never too late to discover our life’s purpose and we owe it to ourselves to make it happen. I truly believe that there are “best fit” careers for each of us – roles that align with our natural strengths, interests, values and preferred work style. When we are in these roles, we perform better with less effort and are ultimately more successful. 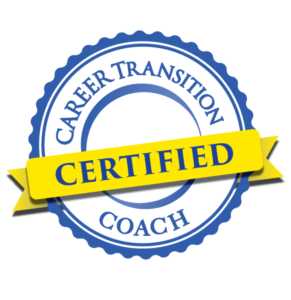 Career coaching focuses on where you are now and the future – not the past. The right coach will help you identify your personal and professional goals and guide you to a successful outcome. Within the coaching process, the coach will help you assess where you are in your life, your strengths, values and motivation to change. The coach helps you create an action plan, and provides feedback to keep you focused, motivated and on track to move from point A to B. Coaching can only happen when both people are actively engaged in working toward the same goals. There must be commitment on the part of the client to go beyond their comfort zone, step into the unknown for the sake of change and persevere when it is difﬁcult. To enable this positive forward motion, the coach offers a safe environment where people can explore, grow, learn and take the risks, and provides guidance and support. Combining the best aspects of several different coaching approaches, I primarily apply the Solutions-Based Coaching Approach because I appreciate how it turns problems into goals. This positive change methodology uses a person’s own strengths and resources to deliver results quicker than problem-focus approaches. I strive to build a balanced Co-Active Coaching Environment and use the OSKAR coaching model to maintain our focus on solutions rather than problems. I use the WISE Framework for career change to help my clients clarify their career goals and identify their next desired role. I share the William Bridges Transition Model to help my clients navigate through change and put the process into a manageable perspective. To help my clients achieve successful outcomes, I customize my coaching process to the individual. I use a variety of assessments depending upon each client’s needs. Interests, Skills, Values and Experience Surveys facilitate the exploration process, as do Appreciative Inquiry-based journaling questions and “Picture This” exercises. I administer the MBTI® to people who are looking for a deeper level of self-awareness. Continuing through the coaching process, we utilize a variety of research and decision-making tools and bridging strategies to prepare my clients for their next role.